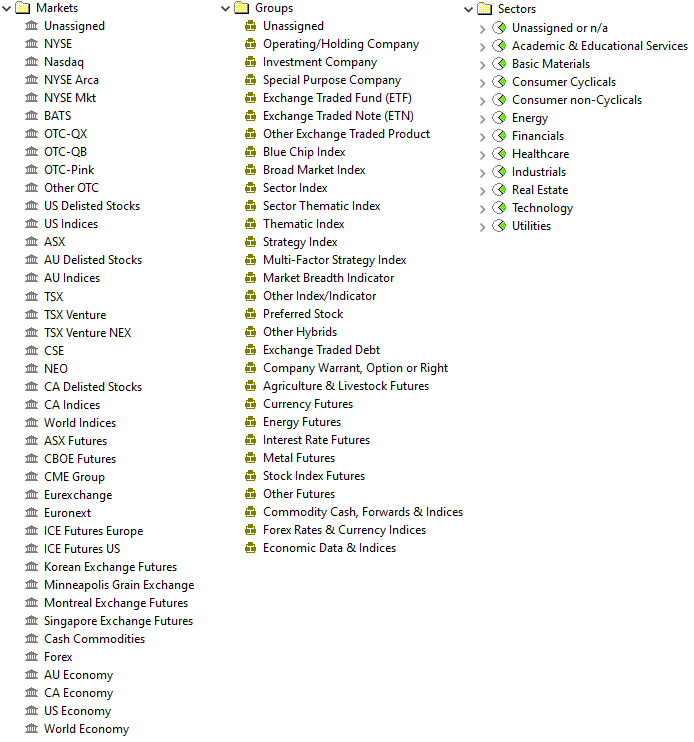 AmiBroker has fields for Ticker, Date, Open , High, Low, Close, Volume, Open Interest, Aux1 and Aux2. Open Interest - this field is only applicable for futures and derivatives data. AUX1 (for Stocks) - shows Turnover, which is the dollar amount of the stock traded on the day. AUX1 (for Continuous Futures) - identifies the current contract month in the series by year and month. AUX2 and Dividends - dividends are shown in the AUX2 field depending on whether or not they have already been accounted for in the data by the "Price Adjustment" method. If the data is adjusted for capital reconstructions only, then both special and ordinary dividends are shown. If the data is adjusted for capital reconstructions and special dividends, then only ordinary dividends are shown. If the data is adjusted for capital reconstructions, special dividends and ordinary dividends, then no information is shown. Operating/Holding Company: This group holds stocks that are generally thought of as "common stocks", where common does not refer to a unit of ownership but to an "ordinary" type of business that provides goods and services. Real Estate Investment Trusts, Master Limited Partnerships and Royalty Trusts are included. Investing Company: This group holds US stocks that are classified as investment companies by the SEC according to the Investment Company Act of 1940. It essentially consists of "Closed End Funds" (the Australian term is "Listed Investment Companies") but also includes Business Development Companies (Pooled Development Funds). Some ETFs are classified as investment companies by the SEC (those organised as Unit Investment Trusts) but these are found under a separate Group for ETFs (of all kinds). ETNs are actually exchange traded debt securities but are also given their own Group. Special Purpose Company: This group includes Litigation Trusts, Liquidation Trusts and SPACs (Special Purpose Acquisition Companies). SPACs often issue Units that bundle the common shares with a warrant. Blue Chip Index - a narrow index that tracks the very largest stocks according to market capitalisation (e.g. Dow Jones Industrial Average). Broad Market Index - an index that tracks the market as a whole, or a broad section of it, according to market capitalisation (e.g. S&P MidCap 400 Index). Sector Index - an index that tracks a business activity that is defined as part of a total market industry classification scheme. A sector index is always part of a hierarchy of sector indices (e.g. S&P 500 Industry Group Banks Index). Sector Thematic Index - a sector index where the sector is uniquely defined and not as part of a total market classification scheme. Also, an index that assembles components from different sectors according to a "theme" such as "Clean Energy" or "Infrastructure" (e.g. Dow Jones Internet Commerce Index). Thematic Index - an index that reflects any theme other than a business activity. A theme may be regional investment, ethical investment, sustainable investment, Sharia investment etc. (e.g. Calvert US Large Cap Core Responsible Index). Strategy Index - an index that assembles components according to a rules-based investment strategy rather than market cap or business activity. A strategy may be "Pure Growth" or "Low Volatility" or "High Dividend" (e.g. S&P 500 High Beta Index). Volatility indices (and similar indices) are included in this group (e.g. CBOE SKEW Index). Multi-Factor Strategy Index - a strategy index where the rules are based on multiple factors that include fundamental measures such as sales, cash flow and book value (e.g. Russell Fundamental Large Cap US Index). Other Hybrids: This group- holds Special Investment Products that are issued by investment banks and complex securities that are issued by companies (such as Mandatory Convertible Securities or Tangible Equity Units). AmiBroker Sectors are populated by the Norgate Data plugin with information from the Thomson Reuters Business Classification scheme (TRBC). The Sectors field has two levels - Group and Industry. Group corresponds to TRBC level 1 (Economic Sector). The AmiBroker Information Window allows the display of "metadata" and "fundamentals". The Norgate Data plugin populates many of the available fields but not all of them. Fundamental data is provided for most stocks but not all. Also, some stocks do not have broker estimates for forward EPS, target price etc., so these fields may be empty. The tables below identify the fields that are generally populated along with definitions. All of these fields are accessible in the AFL via the GetFnData function. Beta Beta A measure of a stock's price volatility relative to the market. The slope of the 60 month regression line of the percentage price change of the stock relative to the percentage price change of the benchmark index. Beta values are not calculated if less than 40 months of pricing is available. EPS EPS EPS excluding extraordinary items - trailing 12 month The Adjusted Income Available to Common Stockholders for the trailing twelve months divided by the trailing twelve month Diluted Weighted Average Shares Outstanding. Book Value (p.s) BookValuePerShare Book value per share - most recent quarter The Shareholder's Equity divided by the Shares Outstanding at the end of the most recent interim period. Profit Margin ProfitMargin Net Profit Margin % - trailing 12 month The Income After Taxes for the trailing twelve months divided by Total Revenue for the same period and expressed as a percentage. NOTE: Most Banks and Finance companies do not report revenues when they announce their preliminary quarterly financial results in the press. When this happens, the trailing twelve month value will not be available. Operating Margin OperatingMargin Operating margin - trailing 12 month The trailing 12 months Operating Income divided by the trailing 12 months Total Revenue, multiplied by 100. Operating Income is defined as Total Revenue minus Total Operating Expenses. Return on Assets (ttm) ReturnOnAssets Return on average assets - trailing 12 month The Income After Taxes for the trailing twelve months divided by the Average Total Assets, expressed as a percentage. Average Total Assets is calculated by adding the Total Assets for the 5 most recent quarters and dividing by 5. Return on Equity (ttm) ReturnOnEquity Return on average equity - trailing 12 month The Income Available to Common Stockholders for the trailing twelve months divided by the Average Common Equity expressed as a percentage. Average Common Equity is calculated by adding the Common Equity for the 5 most recent quarters and dividing by 5. Qtrly Rev. Growth QtrlyRevenueGrowth Revenue Change % - most recent quarter 1 year ago The most recent interim period Sales minus the Sales for the same interim period 1 year ago divided by the Sales for the same interim period one year ago, multiplied by 100. Sales Per Share SalesPerShare Revenue per share - trailing 12 month The trailing twelve month Total Revenue divided by the Average Diluted Shares Outstanding for the trailing twelve months. NOTE: Most Banks and Insurance companies do not report revenues when they announce their preliminary quarterly financial results in the press. When this happens, the trailing twelve month values will not be available. EBITDA (p.s) EBITDAPerShare EBITD per share - trailing 12 month The trailing twelve month EBITD divided by the Average Shares Outstanding for the same period. EBITD is EBIT plus Depreciation and Amortization expenses (from the Statement of Cash Flows). NOTE: This item is not available for Banks and Insurance companies. Qtrly Earnings Growth QtrlyEarningsGrowth EPS Change % - most recent quarter vs corresponding 1 year ago The most recent interim period EPS minus the EPS for the same interim period 1 year ago divided by the EPS for the same interim period one year ago, multiplied by 100. NOTE: EPS must be positive for both periods. If either EPS value is negative, the result in not meaningful. Dividend DividendPerShare Trailing 12 month sum of all split-adjusted ordinary dividends The sum of the Cash Dividends per share paid to common stockholders during the last trailing twelve month period. 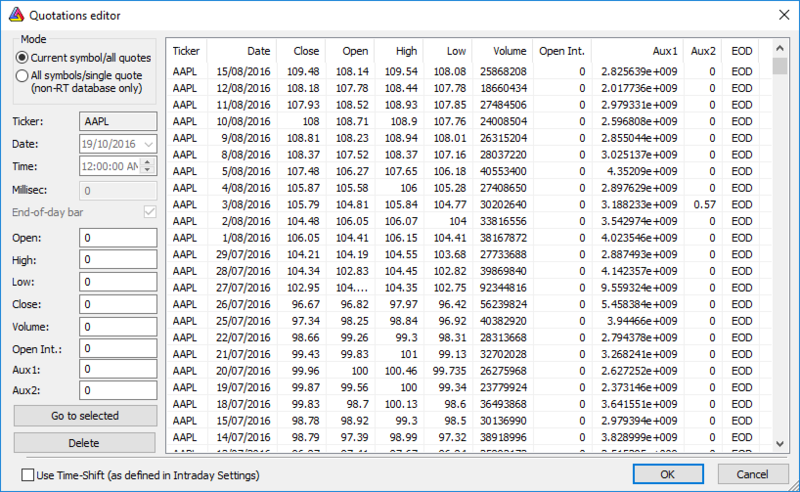 Many additional data indicators/functions have been created in AmiBroker and their usage is described here.